NovaUCD, the Centre for New Ventures and Entrepreneurs at University College Dublin (UCD), today welcomed Evervault, a cybersecurity start-up, and myStudyPal, an edtech start-up, the latest companies to join its entrepreneurial ecosystem. The founders of both companies are currently undergraduate students at the University. 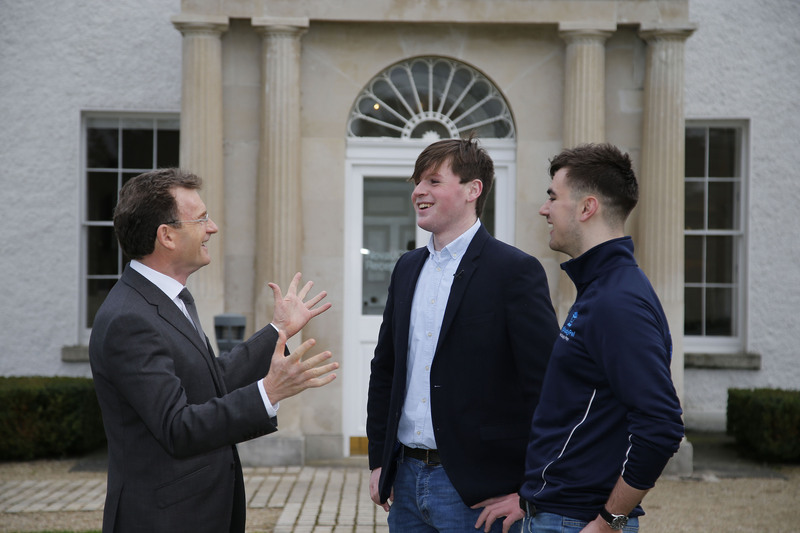 Pictured at NovaUCD are Tom Flanagan, UCD Director of Enterprise and Commercialisation, Shane Curran, founder, Evervault and Mark Nealon, founder, myStudyPal. (Nick Bradshaw, Fotonic). Current approaches by companies, large corporations, and research organisations to manage vulnerable, centralised databases are no longer fit for purpose. To address this issue Evervault has developed and provided a software platform which allows these organisations to process personal data without seeing, storing or handling it. Evervault’s software ensures that encrypted data is separated from any potential attackers through novel hardware and encryption approaches. This means that even if a network is compromised the encryption key remains completely hidden preventing unauthorised access to the encrypted data. The founder of Evervault is Shane Curran, currently a 1st year Business and Law undergraduate student at UCD. In 2017 Shane was the overall winner of the BT Young Scientist and Technology Exhibition, for a project entitled ‘qCrypt’ which forms the basis of Evervault. myStudyPal is a web and mobile app that provides second level students with a simple, fast and effective way to create an accurate and fully changeable study timetable. myStudyPal negates the need for stressful late-night cramming, promotes student wellbeing and ensures a healthy work-life balance. Missed study sessions can be rescheduled at the click of a button and social plans can be added to ensure they never clash with study. Push notifications about upcoming study sessions are also sent straight to students’ mobiles in an effort to combat procrastination. The founder of myStudyPal is Mark Nealon, currently a 1st year Biomedical, Health and Life Sciences undergraduate student at UCD. NovaUCD is a purpose-built, state-of-the-art facility for high-tech and knowledge-intensive start-ups which provides a comprehensive business support programme for client companies. This programme comprises advice, seminars, and workshops as well as facilitated access to the NovaUCD network of researchers, business leaders, and investors. Last August UCD announced a €6.5 million development project to renovate and extend NovaUCD’s east courtyard. When completed later this year NovaUCD’s capacity to support start-ups, such as Evervault and myStudyPal, will increase by over 50%. During the last 4 years, NovaUCD, together with the UCD Innovation Academy and UCD Michael Smurfit Graduate Business School, has run the annual UCD Start-up Stars Programme to specifically support UCD undergraduate and postgraduate students who want to work together to develop and grow start-up companies.